Popcorn chicken. Hmm. I still don’t get how it’s like popcorn (one of my favorite foods of all time by the way). In fact, I’m insulted on behalf of popcorn. Squirts of chicken foam covered in breading and…baked? fried? I guess I’ll never know. It’s a great strategy of mine to be ravenous at lunch time. It really helps. I devoured the mini-balls of chicken foam just like they were cake pops made by Bakerella. I used a lot of BBQ sauce, which might as well have been frosting. My body was ready for calories so it didn’t care what vehicle delivered them. The mind played yet another trick: I thought they were just delicious. One of you cutie patootie readers suggested timing how long it takes to peel and eat an orange. Why didn’t I think of that? I have been b*tching about how unsliced oranges are too hard for kids to peel, but I had no hard data. It took me 55 seconds to peel the orange. Then it took me an additional two minutes to gobble it down. It should be noted that I have pretty fantastic fine motor skills if I do say so myself. Kids, well, I can’t say. The rind was pretty thick, which actually made it a little more challenging as it came off in little bits not in a large piece. That’s the kind of investigation I’m going to have to undertake next year when I’m not chained to my room for lunch every day. The veggies tasted good to me: actually better than usual. That’s only my perception, which may or may not be reality. I asked a couple kids what they had for lunch. Total silence. They were looking around the room. “Mm, hmm,” one boy responded nodding. I laughed. See what I mean about how they tell me what I want to hear? Regarding the Hart and Risley study from yesterday, I don’t take such a bleak view. I do believe that there can be tremendous growth, especially before age 7 (some contend that personality is set by first grade). I believe kids grow and learn at their own pace. I think early intervention works (from birth to 3) and preschool (age 3 to 5), changes the trajectory of students’ lives, especially if kids get two full years. Here’s another wrench in the works: what about when your child was born? I see children with summer birthdays starting kindergarten at age five and really struggling (boys having the worst time). Their friends born in the fall and winter have big advantages. Although many parents want their child to start kindergarten as soon as possible, there should be no stigma attached to being older. I speak from experience. My birthday is in September. My mom pushed to have me start kindergarten at age four. I was academically ready, but I wasn’t socially mature. I was pretty shy. Then my family moved all over tarnation and I had trouble making friends. I became extremely socially anxious, which I didn’t totally shake until I was into my 20s. When I was in high school, the girl with the locker right next to mine was more than a year older than me and kids from the year below mine were my same age. I graduated high school at 17 and college at 21! I was a baby! Thoughts on age and schooling? One of the annoying things about packing for me is that while I’m packing my son’s lunch, he’s often begging for food I’m putting into his lunch. It’s like, dude, eat your breakfast! Often if he has yogurt for breakfast and I pack it, then he won’t eat it at daycare. This morning for breakfast he ate a bunch of blueberries and pears and then some gf cereal in goat milk (a big breakfast for him). He started demanding more pears and I had wanted to save those for lunch. Thankfully even though he ate a lot of pear slices at home, he ate all of the pear slices I sent for him at daycare. The only thing that came home was three green beans! I didn’t pack blueberries because of the choking hazard thing, which I’m now taking even more seriously after the anti-grape comment from an ER doctor! My husband and I have been buying more buffalo meat. A long time ago when we first discovered Fuddrucker’s, we tried both buffalo and ostrich burgers (they taste great). I haven’t been to Fuddruckers in many years, but we have wanted to continue eating buffalo. We’re not into beef at all. For dinner I made very plain buffalo tostadas with a corn tostada, buffalo, sliced mini-tomatoes and avocado. If I had had more time, I would have made some kind of black bean mixture with the buffalo, but I didn’t get the chance. Anyway, our son devoured the buffalo on “chips.” So I sent it for lunch and I guess it was a hit. My boy doesn’t always want to eat rice so when I found these rice molds on amazon, I wanted to try them. We make rice in a rice cooker and when it’s hot, I place it into the molds. Then I feed it to him and freeze the rest so that I can just plop them into his lunch. He thinks rice is a lot cooler when it’s in a shape. Yes, I do resort to trickery! The daycare menu was ground beef, pasta with red sauce, diced pears, and baby peas. My lunch attempted to mimic, but I couldn’t do even gf pasta again. Their lunches are so wheaty! As far as getting our son to eat well, we are firmly in the “Here’s your food. Now your father and I are going to pretend we could care less if you eat or not.” We got that advice from an experienced mom on New Year’s Eve, literally days before he first got fussy. So there were some nights in January when our son ate one mouthful for dinner and that was it. We tried not to freak out. I guess it worked. Also whenever he was sick, he would stop eating and we wouldn’t force it. And upon recovery, he would eat like a champ. He was sick so frequently that we just got used to that cycle. YEAH! We made it. Thoughts on the week? A $25 gift card to ChefsCatalog.com. I received the gift card at BlogHer, but I haven’t gotten around to using it. Now you can! Previous PostDay 156: pasta and The Eat Along Challenge (#4)Next PostDay 158: peanut butter & jelly "sandwich" !! Thoughts on age and schooling- Have you read Outliers by Malcolm Gladwell? He spends some time on that subject and it is very intriguing. that's alot of bread in the lunches. i always why they wont add more fruit since its sweet kids love it. 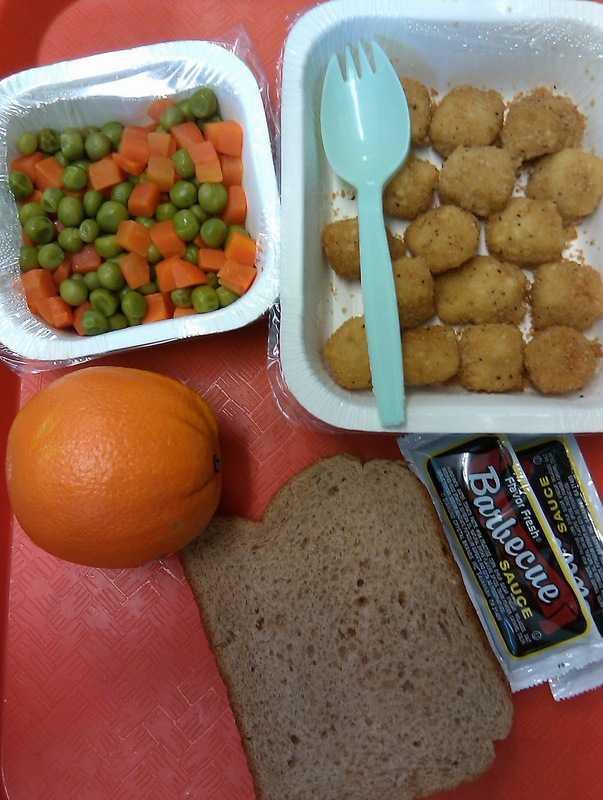 i never ate school lunch until job corps everything was homemade and no carbs. That has got to be THE most adorable lunch I've ever seen. That rice star is absolutely darling. I wanted to eat that lunch too! 😀 Talk about master of presentation! 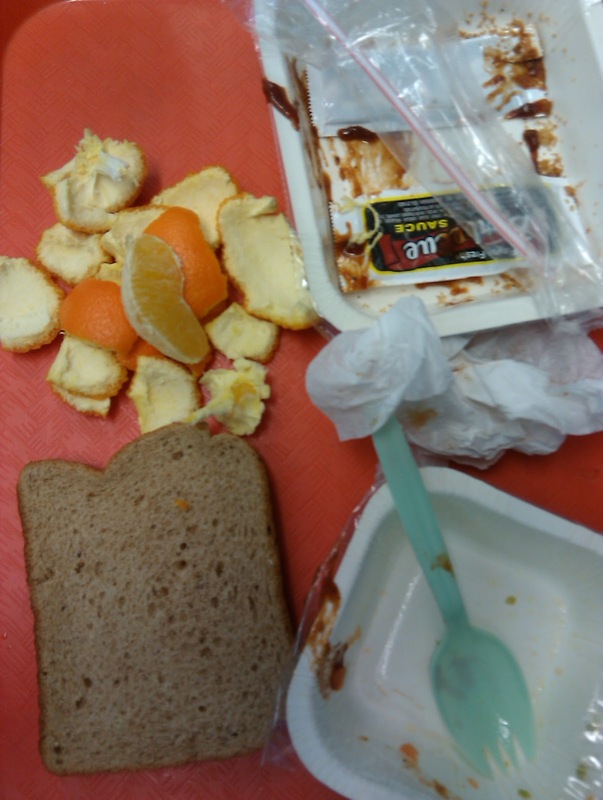 I love the photographs of your son's lunch, but I'm realizing after a few days of seeing them that they contrast so starkly compared to the lunch you have to eat when YOU go to school. Woah. My school lunches in elementary school consisted of sub sandwiches and some kind of fruit (apple or orange, and the rare banana). I seem to remember the lunch supervisors (volunteer moms and the occasional teacher) carrying around orange rind cutters. Basically a somewhat sharper (though not by much) crochet hook. 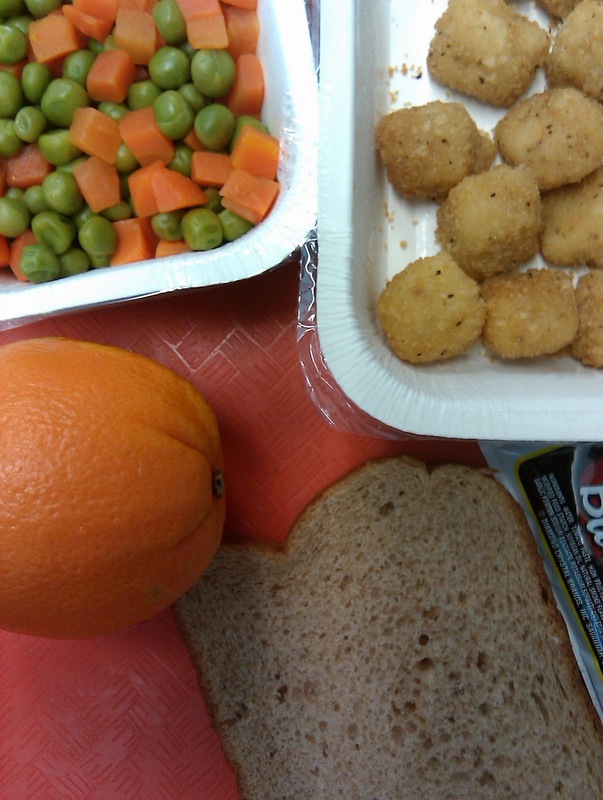 Helped to peel the oranges, but we still never liked the healthier lunches. Thoughts on age and schooling: This is something I think about quite a bit. I have an October birthday and my mom had me tested into Kindergarten at 4 also. She felt I was ready academically and socially. I was also tall for my age and she was worried about me being the "big girl" in class (as she was). I too graduated high school at 17 and graduated with my Doctor of Pharmacy degree at 23 (the youngest in my class). I have always felt that this was the right thing for me. I have always been a leader (bossy 1st born) and have never been shy. I think I may have been if I was held back a year. Now, I have a daughter with an October birthday and wonder what will be best for her. She is the 3rd child and i feel that may have some effect on her readiness. She's only 2 months old, so I have a some time to figure it out luckily. Age and schooling: My birthday is in November and I was four when I started kindergarten. Like you, I never had academic trouble, but did struggle socially–especially when I reached junior high and was much smaller and less physically developed than other girls in my grade. In contrast, my daughter was nearly six when she started kindergarten (January birthday) and it's made a huge difference throughout her elementary education, both because she's older and more mentally/emotionally mature, and also because being physically larger than most of her classmates has made her more confident and (I think) deterred a lot of bullying. Even really rotten kids seem to think twice about starting crap with someone who's four inches taller and 20 pounds heavier than they are. I like the pictures of the dairy and gluten-free foods. I'm considering going totally free of both and was nervous about the lack of meal options, so this is giving me great ideas. It can be tough, though, when I go out to eat with friends or coworkers who are eating pastas and pizza and sandwiches…how do you find things to eat? And the looks of pity they give you when you explain you're avoiding both gluten and wheat are kind of embarrassing. My brother started school at 4 and finished school at 14. He was incredibly advanced for his age and was jumped from 4th to 6th grade and again from 10th to 11th grade. I started school at 5 and finished at 18 like the majority of my friends and I was fine too. My school tried advancing me two grades in elementary school and my mom said no for me. Not because I wasn't ready socially or emotionally but because my math skills were not good enough. My students are all over the place. I have 16 year old seniors, 18 year olds, and 19 year old seniors and they all do fine without any concerns over their age. I tend to think that age in education has very little bearing upon much at all. In Finland, a kid starts first grade the autumn of the year they turn 7. Over here, preschool is one year in kindergarten the year before you start first grade, and at the end of that year, the preschool class teachers can forward a child to a child psychologist, if they suspect a child's still too immature for first grade. If they miss that, it's not uncommon, especially for boys, to sometimes be left on the class, so they get to redo it. I did the equivalent of sr. high in four years in stead of the average 3, since I was hogging extra courses beyond the compulsory 75/3 years (I came out with closer to 120 courses, with better than average grades, and a visual arts education), and haven't stressed about not having a degree yet. I've dropped out of university twice, due to social pressure pushing me to my limit than due to trouble in subjects I was studying (I'm on the autistic spectrum, and I don't deal well with people face to face). I'm partially reading these kinds of blogs, because of my children being "destined" to be Americans (I'm marrying an American next spring, and our children are going to be born and raised in the Pacific Northwest), and I'm rather unfamiliar with the US school system. The more I read, the more determined I am to at least consider homeschooling the children I might have some day… I see people complaining about the same things I found to be bad for my mind at schools I attended, and think children need to be taught a new kind of academic brilliance. Problem solving and information gathering are much more important than rote learning and standardised tests in the long run for their lives and careers, and I want them to have the best possibilities in their future. To make a comment that may or may not sound odd, but what I find, when looking at a majority of lunch contributions, is that it's more what I'd classify as "snacks" than actual food. I understand children have restraints on what they may or may not eat, for example choking hazards, or lack of microwaves. But I still want to place a question to those who package crackers and cold cuts or just sweet muffins and cookies and juice… Have you ever considered getting a thermos cup, or tried to get PTA to address the lack of microwaves in lunchrooms at schools? I understand that children can be picky eaters, but that's where the cute rice shapers, seaweed punch-out faces and star or flower shaped vegetable cutters, octopus shaped sausages (sorry, "wieners" in the US, right?) come in. If you look at the "plate model", or "food circle", and compare your lunch to it, does the "balance" of the model fit your lunch? Perhaps I'm a little uptight and annoying with my questions, but I would like to add one more thing: I have noticed that every ad campaign for food in the US I've seen lately, especially juices and pasta sauces and such, the ads are always going "it contains at least one serving of vegetables disguised by the fruit/meat/spices, and your child/husband/dog will never know!". When I grew up, we always had some vegetables on our plate. My mother gave us peeled carrots as snacks so we'd refrain from gnawing our arms off prior to dinner being served, and I can't remember getting candy more than a couple of times a year, most often Christmas, Birthdays, and the random instances, when my mother brought a bag of candy home… But never ever regularly. Her strategy was good. My now 18 year old brother came home from visiting a friend once, and our then 8 year old boy looked at my mother with surprise in his eyes when he told her "they didn't have a salad with dinner!" Adorable, and the way things can and should be. My school has an option for kinders who aren't ready for 1st grade. We have a grade between Kindergarten and 1st grade. It's not just for students who academically ready for 1st, but they can go to that grade for a variety of reasons. Academic, social, developmental…etc. All the parents I've talked to who have been through the grade level are really satisfied with the experience and feel like it's really helped their kids. On the other hand, I read an article a few years ago about parents "red shirting" their kindergartners so that they're bigger when they get to high school and want to play sports. THAT I'm against. by the way, I love the star-shaped rice…what a brilliant idea!! I might get those myself! also, I hope that you'll continue posting your son's lunches…otherwise, I might get blog withdrawal feelings if you stop blogging about food after this year is over…LOL! We eat a lot of deer meat, or as most other people like to call it "venison". We hardly ever eat beef. Venison is very lean and good for us. We even drain off the extra greese on the bottom to make it even better. I've never had Buffalo. It sounds good though! On age and schooling… I, too have a Sept. b-day and started kindergarten at age 4 (my mom was a teacher, she should have known better!) and college just before age 17 since I graduated early. I was ready academically but not socially…and I was very small for my age, yikes! Also an only child growing up in daycare, and forced, like you, to move all over "tarnation" (9 schools from K-12) I was painfully shy and withdrawn! I got over that as a college sorority girl, amen! I had so much fun and distraction it took a while to graduate! Despite the rough start, it made me who I am today, very adaptable, social, and empathetic…and neurofeedback has been a godsend! About the long hours of writing/blogging, I feel your pain. It is a wonderful experience, but take some time off to enjoy your family, I did! Kudos to you for a great job! My birthday's in Sept., too, and I started kindergarten just before my 5th birthday. I was tall for my age, ready socially, and chomping at the bit academically. Even though I was one of the youngest kids in my class, I was the tallest kid in the class all thru elementary school. I never really thought about it before, but that probably did help me socially. I attended a brand new public high school that was considered experimental at the time (early 1970's). There were no classrooms. Instead, there was a large open area called a "pod" for each subject. There were pods for math, science, English, social studies, foreign languages, etc. Classes were team taught by groups of 2 to 4 teachers. At any given time, 2, 3, or 4 classes would be conducted simultaneously in a pod, all guided by one or more teaching teams. At the same time, there were students doing independent study in each pod and those students were monitored by a teaching team as well. Clearly geared toward college prep, independent study options allowed kids to complete more courses than in a traditional high school if they wanted. Like many of my classmates, I thrived in that environment and completed several extra courses. By the time I finished my junior year, the only credit I needed to complete in order to graduate was a quarter credit of phys. ed. As a result, I was allowed to attend school half days during my senior year and I worked in the afternoons to earn $$ for college. Looking back, I feel incredibly fortunate to have attended that high school. I think I would have been miserable in a traditional, structured high school. Middle school (grades 7 thru 9 in my district) was a complete yawn and 3 more years of the same would have been pure torture. If you'll have me, I'd love to continue blogging. It's been such an outlet for me. I really enjoy blogging. Every time I read a blog post from someone, I feel like I am walking away having had a conversation with that person I want to continue talking with you guys! I'd love to see you continue blogging! I found your blog around March, I think, and went back and read from the beginning, and have read every post since. 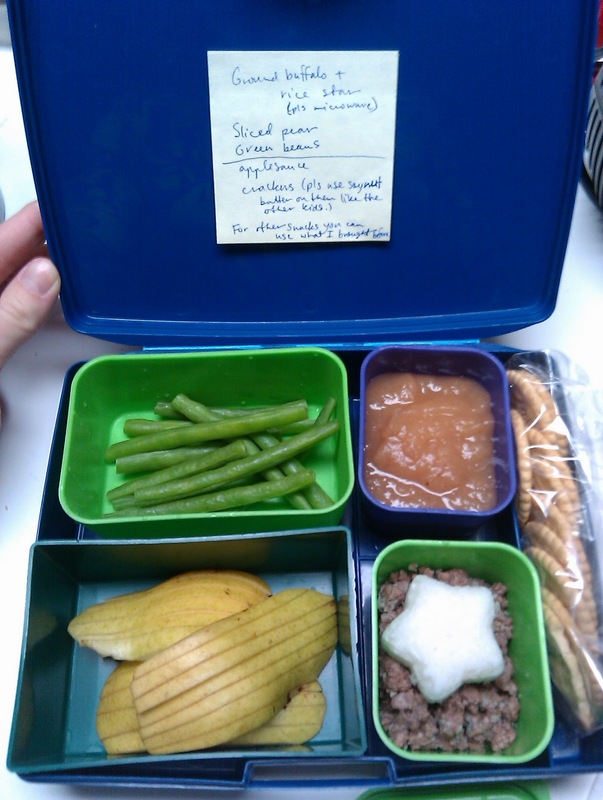 I agree with previous poster's, your son's lunches look fantastic! I can't wait to see what you bring for lunch for yourself! If we'll have you? Are you kidding? I've commented here on this previously but it bears repeating. Your entries last summer while you were not eating school lunch were phenomenal. You always managed to serve up topics that were at once captivating and relevant to school lunch reform and time and again, you managed to spark provocative discussions. Mrs. Q, if you blog it, they will come…… and read and think and discuss. May birthday here — graduated high school maybe two weeks after I turned 18. Also the first-born of two to young (19 and 20) parents who argued often. Because of that, I am not a type-A bossy leader — rather, I'm a peacemaker who's comfortable speaking in public and to groups. I prefer servant-leaders and servant-leading. Teachers approached my parents about my skipping first grade, but they chose to let me follow the traditional path. I have no hard feelings about this; they chose the right path for me. For summer sports with different cutoff dates than school, I alternated between being happy and annoyed that I was held back with younger kids for these activities. It was nice to be the oldest in a group for once, but it also meant I had to wait a whole extra year to attain certain certifications (and qualify for jobs) than I would have if I'd been born two months earlier. My Birthday is in Nov. and my parents sent me to school at the age of 4. I was really to young and struggled a bit when I got to the middle school years. I was pretty mediocre in school until the end of high school and college. I feel I was mature enough to do well. My sister who is much younger but also born in Nov. and was kept back a year. She academically has always been been at the top of her class. So I think I could have benefited from staying back a year. With just 20 minutes for lunch, I'm not sure most kids will take the time to peel an orange. A Clementine? Maybe. I say it all the time: The fruits and veggies on the school lunch menu have to smell great, look great, and taste great if we want kids to gobble them up. Looking forward to your future posts … whether you're eating school lunch or not. My birthday is in February and I skipped kindergarten and went directly into first grade so I graduated from highschool a couple months after I turned 17. I was often bored in school and usually tested at the top of my class so that the school wanted to move me up another grade. My mom wouldn't let them do that, but I do think that starting me a year early was a good idea. I was socially very shy; but I was always an introvert so holding me one more year wouldn't have helped that. I think kids that are bright enough to start school early often are socially awkward and will be no matter when they start school. At least that's my experience working in an office full of engineers and scientists. I always enjoy reading your students response to your lunch inquiries. Thank you Mrs. Q. The September 1st cut off for entering kindergarten hasn't been around forever. The date has crept up with the increased emphasis on academics in kindergarten. When I was entering school, the cut off was December 1st. I have a September birthday and started school just a few days before turning five. My age was only a problem when I graduated from high school at 17, and found it harder to get a job that summer before college. My son has a late August birthday and started school when he had just turned five. My daughter has a late September birthday and was almost six. He’s a college senior; she’s a high school senior. We didn’t fight the cut off with either one, despite advice in both directions. Being at the younger end of things was only, let’s say, “interesting” for us when our son was fifteen and all his friends were sixteen and driving. He counted the hours until he, too, could get his license. Of course, our daughter was the first in her group to get a license, and is pretty blasé about it. She was more excited about being the first one to vote. My daughter has a November birthday, and she started kindergarten when she was six. It's definitely been the right thing for her, but I think that all kids are different, and parents are probably in the best position to make that decision for their kids. My oldest, a boy, was born in July. When he was five, lots of people told us to hold him back a year. But the kid could already read (he's very verbal; started talking at 7 months). We didn't want him to be bored silly in school, so we went ahead and started him in kindergarten at 5. He is the youngest kid in his class, and this year he is the youngest kid in jr. high. He is less socially mature than the other kids, even though he uses the vocabulary of a college student (I'm not exaggerating — everybody comments on it). And yeah, he gets bored at school. He's on grade level for everything but reading and English where he's beyond 10th grade level, but he's still bored. Had I held him out until he was 6, it would have been a disaster academically. It's not quite a disaster socially — he's catching up to his peers, albeit slowly. Middle kid was born in early July. She started Kindergarten at 5 and has been doing exactly as expected. Really normal kid. My youngest was born in January. She was academically ready to start kindergarten at 4-and-8-months, but we met with her preschool teacher and the kindergarten teacher. They were willing to test her and get her into kindergarten "officially," but, as the pre-k teacher pointed out, she still needed naps. She still wanted the teachers to do her work for her, even though she was perfectly capable of doing it for herself. The K teacher noted that the kids who went a little early (like she did) usually did well in K and 1, but started to slip in 2nd grade and then end up repeating it (parochial school where it's okay to flunk an elementary school kid). We decided to keep her in pre-K another year, with very mixed feelings. However, now that she is in 1st grade, I'm very pleased with the decision. She is used to being the youngest everywhere, but at school, she is one of the oldest (not by much — three other kids are born within a couple weeks of her and one was born in Dec.). She is a leader in her classroom, and now I can see how important that is to her. She doesn't need to be babied everywhere.